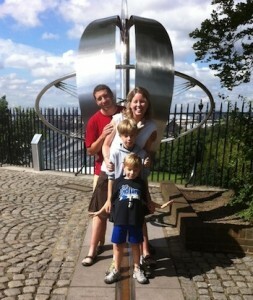 Me and my family straddling the meridian line at the Royal Observatory, Greenwich, UK. 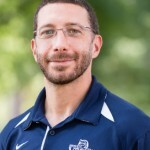 I teach a variety of courses including introductory astronomy for non-science majors, computational physics for physics majors and engineering, and classical and quantum mechanics for physics majors. I occasionally have the opportunity to teach an Honors course on extraterrestrial life. I am particularly interested in using computers to teach physics and astronomy, and using the history of science to teach science to non-majors. For more information about my teaching, please follow the links in the TEACHING menu above. My research specialty is computational quantum mechanics. I study properties of simple quantum systems and explore connections between these properties and the dynamics of the classical version of the same system (an area of research sometimes called “quantum chaos”). For more information about my research, please follow the links in the RESEARCH menu above.